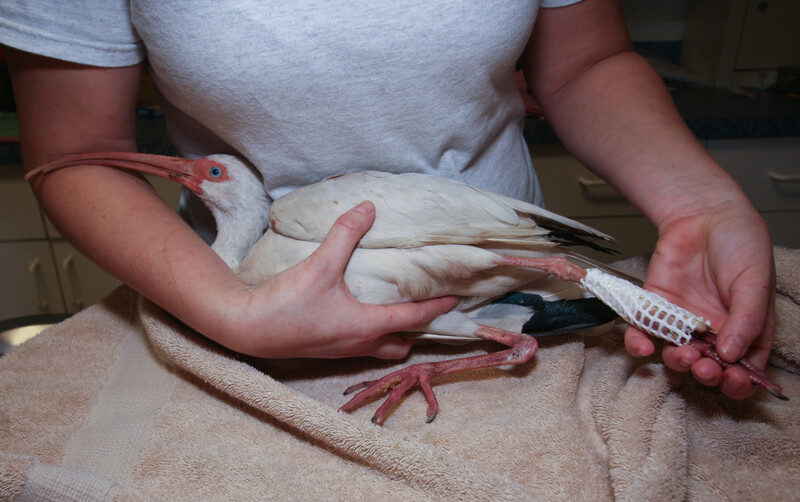 I noticed a limping White Ibis near the Old Tavernier boat ramp just before dark on New Years eve, caught it, wrapped it in a towel, called the nearby Florida Keys Wild Bird Rehabilitation Center and within half an hour Amanda arrived to help me catch it again in our fenced backyard and take it to the FKWBC hospital. She said they get a lot of ibises with broken legs. She wasn’t sure why. Turns out this one has a badly shattered ankle that needs a cast for at least two weeks before the FKWBC knows whether they can release it or will need to keep it in captivity. It’s probably from a small flock of ibises that feeds along the roads and on lawns in Old Tavernier, so I’m hoping to help the FKWBC reunite it with them a.s.a.p. in the new year. It was hard to catch – played a winning game of hide and seek behind the trunks of a row of frangipani for a while, but finally dashed in under a bush and got stuck. As I reached in to grab it, it turned its head and opened its beak and I braced for some serious finger pain… but its grip was as soft and gentle as an old person’s, probably because like most wading birds they mostly use the sensitive tips of their scimitar-like beaks to probe for food, not to break or clamp down on anything. UPDATE, 1/28/14: Amanda (FKWBC) called this morning to report that they removed the cast yesterday and the ibis did pretty well without it, will only need about a week of “physical therapy” (hard to imagine for an ibis… I didn’t get details… will report back if/when…) before being released – probably outside the FKWBC bayside facility where it will be safer than in Old Tavernier. UPDATE, 2/8/14: Ibis recovered enough to be released this morning at the Wild Bird Center in Tavernier, where it will probably join the wild-but-quite-tame ibis flock that hangs out there. 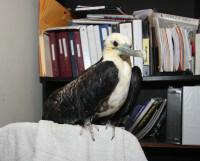 Florida Keys Wild Bird Center employee Kayla with Old Tavernier ibis in ankle cast. 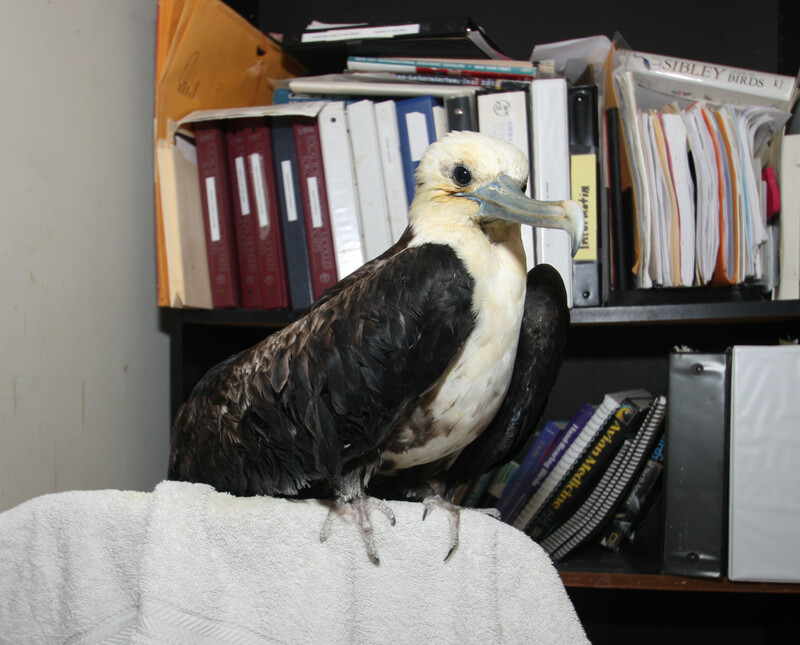 Magnificent Frigatebird at the Florida Keys Wild Bird Center hospital – a permanent resident (injured wing).